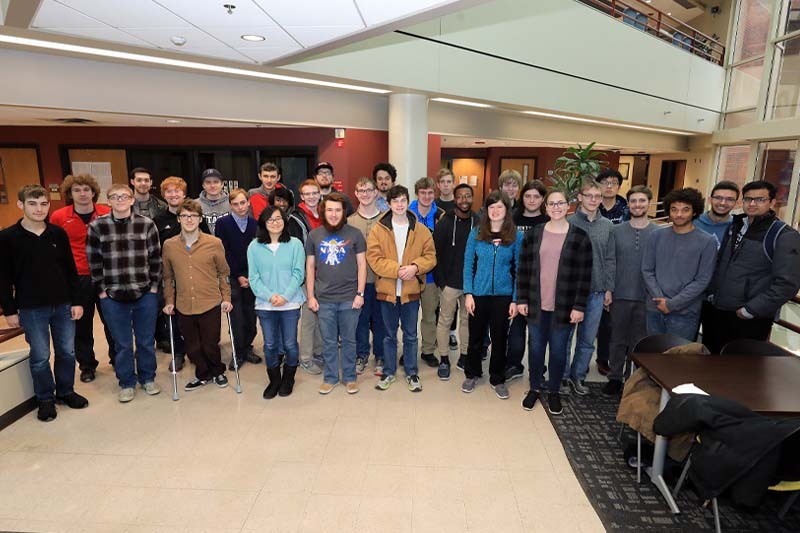 A team of students from the University of Nebraska at Omaha (UNO) recently out performed more than 500 other universities in the national Putnam Mathematical Competition, placing them among an elite group of undergraduate students nationally and internationally. Each December, thousands of students and hundreds of teams from across the U.S. and Canada participate in the William Lowell Putnam Mathematical Competition, which challenges undergraduate students to tackle 12 complex math problems - earning up to 10 points for each part of the problem they correctly solve. Results of the exam were announced in late February and, this year, just over half of all participants scored at least one point. All told, UNO had 27 students take the Putnam this year, which is the most in UNO's history; 14 students earned points on the exam - a record for UNO. As part of the competition, each university has the opportunity to submit a team of three students, whose combined scores are used to place them among other institutions. This year, for the first time since 2013, UNO's team placed in the top 10 percent, ranking 56th out of 568 total universities and colleges participating. Leading the team this year was senior Cody Anderson, a triple major earning bachelor's degrees in math, physics and computer science. Anderson earned 20 points, placing him in the top 13.5 percent of all participants. Anderson, who is also a member of the Pi Mu Epsilon mathematics honors society and Thompson Learning Community, says that his experience on the Putnam Exam will be a huge benefit to his career aspirations. "Ultimately, I want to go to grad school to get a doctorate, but right now I am still deciding on what schools I want to apply to, and if I want to stay in America or apply internationally," he said. "I was really excited to find out how well I did; it felt like quite the personal accomplishment. I am planning to include my score on my applications in the future." Three other students scored highly this year, making it into the top quarter of all students competing. Junior Sarah McCarty, a double major earning bachelor's degrees in math and computer science, placed second among UNO participants with 11 points, placing her in the top 23 percent of participants. Additionally, Grant Moles and Brad Tuttle each earned 10 points, placing them in the top 25 percent of participants. McCarty, who is a Scott Scholar, says she owes her accomplishments in part due to the supportive nature of UNO's faculty and staff. "UNO's Math Department has been very flexible in providing me and allowing me to take more advanced mathematics. Exposure always helps with things like the Putnam exam and ... enrichment activities like the 'Problem of the Week' or socializing with other people interested in mathematics also give me a chance to consider interesting problems and their even more interesting solutions." McCarty hopes to go on to earn a graduate degree or pursue a career in application development. Griff Elder, professor of Mathematics, helps prepare students for the Putnam each year. This is the 20th year UNO has fielded a team. "People may be familiar with a variety of middle or high school-level math competitions, but at the undergraduate level there is really only the Putnam competition," Elder says. "If you do well, it truly travels with you and can often give you the opportunity to do things that end up being quite noteworthy. It shows an ability to persevere in the face of a challenge and not be put off, which are incredibly valuable traits in the fields of math and computer science." Elder hopes that his Putnam teams continue to grow and that, through that, students have the chance to build relationships, gain important skills and become strong ambassadors of what UNO provides students. "UNO's Math Department has students who go on to do remarkable things. If you are a high school student in the metro looking for a math undergraduate degree, you should be looking right here."